Panta De Can Borrell is an epitome of natural beauty. 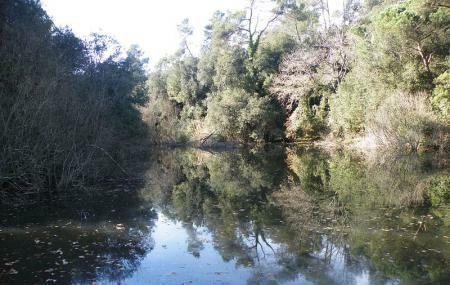 Surrounded by Mediterranean Oak Forest and Pine wood trees, Panta De Can Borrell is an old dam in Collserola mountain range. The name Can Borrell is there in its name as this dam was specially built to provide water to the farmhouse called Can Borrell. You can not only admire the beauty of the dam but also have a look at the beautiful flora and fauna near the riverbank. The circular route of “tail of Marsh” makes the visit more entertaining and enjoyable with which you can cross the other side of the torrent. Use Can Trabal trip planner to visit Panta De Can Borrell and many others to your visit. Oomph up your visit by adding the best hotels in Can Trabal like Sitges Apartment, La Santa Maria, Hotel Palou and Hotel Led-sitges. Curated Can Trabal vacation packages await! Book the best ones and start turning your dream into reality.Discover various ways for how to reach Can Trabal and complete the booking by choosing your mode of transport. Love this? Explore the entire list of places to visit in Can Trabal before you plan your trip. Fancy a good night's sleep after a tiring day? Check out where to stay in Can Trabal and book an accommodation of your choice. Ruta para niños es perfecta y pasar un buen día. Un sitio perfecto al lado de Barcelona ideal para ir con niños, el camino desde la Masia Can Borrell hasta el pantano son menos de 20 minutos y el acceso es muy cómodo. Lugar perfecto para hacer un Kit kat, cuando estas realizando Trail running, genial..